GM has been making and selling vehicles since 1908. They know a thing or two about quality, reliability, and the spirit of the automobile – even becoming the largest manufacturer on earth from 1931 through to 2007. Today, General Motors operates 396 facilities on six continents, representing 20 brands worldwide – with some of its most popular and successful vehicle brands born and bred from Detroit, Michigan. In this post, we’ll tell you about the top rated GM vehicles of 2017 according to Consumer Reports, awards, and public perception. The answer to the Ford Mustang, the Camaro famously was re-released in 2010 when it was thrust into the cinematic limelight as Bumblebee in the Transformers franchise. Since then it’s undergone a few modest aesthetic upgrades – but looks aren’t the only thing that makes the Camaro a top GM pick for 2017. As a bonus, the Camaro ZL1 model does borrow the LT4 supercharged V8 from the Corvette Z06 that produces 650 HP, helping propel the car to a top speed of 198 miles per hour, lapping the fabled Nürburgring in a time of 7:29.6. 2017 also saw the Camaro get its 1LE performance package back, offering beefier track performance and handling, improved aerodynamics, and race-inspired adjustable suspension. The package was available on both the V6 and V8 options, depending on customer preference. To cap it all off, the Chevy Camaro was named one of the Top 10 cars of 2017 by Car and Driver Magazine. Boasting a standard and peppy turbo-charged engine, a compact and sporty appearance, and an innovative available 1.4L clean diesel engine option that gets 4.6 L/100km (shared with the Equinox), the 2017 Chevrolet Cruze made its mark in 2017 for its unwavering dedication to quality, functionality, and efficiency. Known as Chevrolet’s “most global vehicle,” and available as either a sedan or a hatchback, the Cruze came to us in 2008 and was updated in 2016, coming to market with a standard 1.4L turbocharged 4-cylinder engine and a whack-load of available features to enhance user-friendliness like push-button starter, a premium Bose sound system with external amp and subwoofer, eight-inch Chevrolet MyLink infotainment system with navigation, a power tilt-and-sliding sunroof, and power seats. 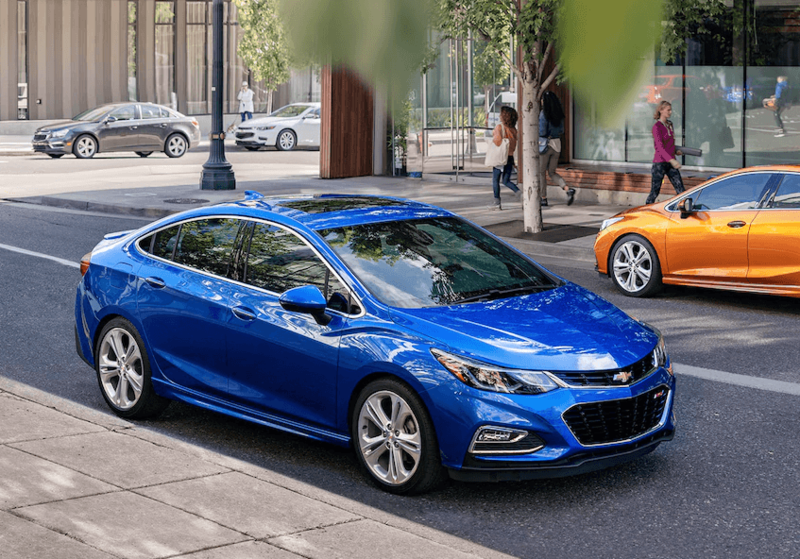 Styling is influenced by the Impala and Malibu, but the Cruze has its own identity, as an innovative and efficient urban warrior with value, style, and expressiveness in mind. Caddy’s newest flagship vehicle, the CT-6 is the GM brands biggest and most luxurious sedan offering, placing third behind brands like Mercedes-Benz and Volvo in a cross comparison of all 2.0L turbocharged premium sedans. Comes with the 2.0L turbo engine coupled to a two-motor electric-variable-transmission providing 335 total HP, and a maximum combined driving range of 708 km and combined 3.79 L/100km fuel economy ratings. The Cadillac CT-6 makes our list for its anticipated release in 2017, its electric capabilities, its trademark comfortable ride with smile-inducing sporty handling, and its Cadillac brand of North American luxury. In 2009 GM was renewed, and began a journey of reinvention and re-imagination – earmarking 2017 as its most progressive and successfully innovative years since inception. These 2017 models piqued interest in GM products, thanks to the brands’ dedication to innovation, and identity reinvention.